This week, among seventy-eleven X-Men and Avengers titles and umpteen All-New Marvel Now! 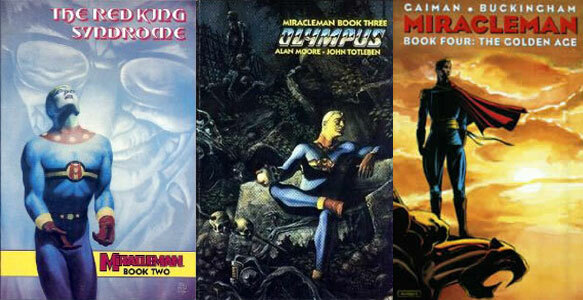 reboots, Marvel will publish MIRACLEMAN #1. 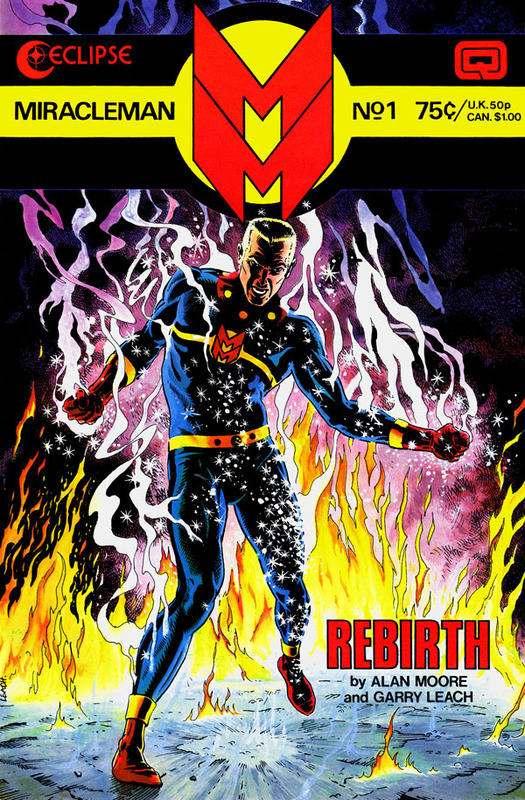 Miracleman #1 is a remastered reprint of a book originally published in color in 1985 by Eclipse, which reprinted a story originally published in black-and-white in the UK’s WARRIOR comic, based on a line of light-hearted 1950s British superhero comic books, based on the Fawcett-published Golden Age American superhero Captain Marvel. Skip the movie, though, because in 10-and-a-half simple steps you can learn everything you should know about Miracleman. Amaze your friends! Astonish your co-workers! Be the center of attention at parties! That is, if they care about Miracleman. 1. He began as a whimsical, high-adventure comic patterned on Fawcett’s Captain Marvel. Reprints of the American Marvel Family comics were incredibly popular in postwar Britain. (There will now be a slight pause while you ask “How popular were they?”) They were so popular that when Fawcett ceased publication (thanks to the infamous lawsuit by DC over Captain Marvel’s similarities to Superman), in 1954 British comic writer Mick Anglo created the Marvelman Family: Micky Moran, who became Marvelman when he shouted the magic word “Kimota!” (“atomic” backwards), and his sidekicks Young Marvelman and Kid Marvelman. The series ran in several comics published weekly (the standard publication frequency for most British comics) until 1963. 2. The comic brought Alan Moore’s superhero writing to the US. In 1982, Moore revived Marvelman with a modern, adult sensibility in the UK comics anthology magazine Warrior. American publisher Eclipse began to reprint the (colorized) stories in 1985, retitled Miracleman to avoid legal complaints from Marvel Comics. It wasn’t America’s first introduction to Moore — his DC debut in Saga of the Swamp Thing #21 had come out in late ’83 — but it was the first straight superhero work by Moore published in the US. A year after this Moore would script the final issues of DC’s Superman and Action Comics before their John Byrne-helmed reboot, and Watchmen would follow in 1986. In the meantime, American interest in Moore’s earlier British stories like The Ballad of Halo Jones, Skizz, and D.R. and Quinch resulted in US reprints by Quality Communications. Moore had conquered America and broken a path for the British Invasion of comics creators. 3. It rode the crest of a wave of mid-eighties independent publishers and the direct market. The mid-Eighties: Ah, what a wonderful time for comic book fans! No longer was the playing field simply DC, Marvel, Charlton, Gold Key and Archie. Thanks to Kevin Eastman and Peter Laird’s self-published Teenage Mutant Ninja Turtles, independent comics and their publishers were on the rise. The growth of comic book shops meant newsstand distribution was no longer the sole means of getting comics to a reader, and new publishers sprung up: Mirage, Pacific, Fantagraphics, Comico, First, AC Comics and Eclipse. It was the beginning of what’s frequently called the Modern Age of Comics, or, if you’re a pessimistic type, the Dark Age. Miracleman was a perfect storm of the right writer and the right comic at exactly the right time. 4. It was a pioneer in taking light-hearted comic book characters and turning them dark and modern. 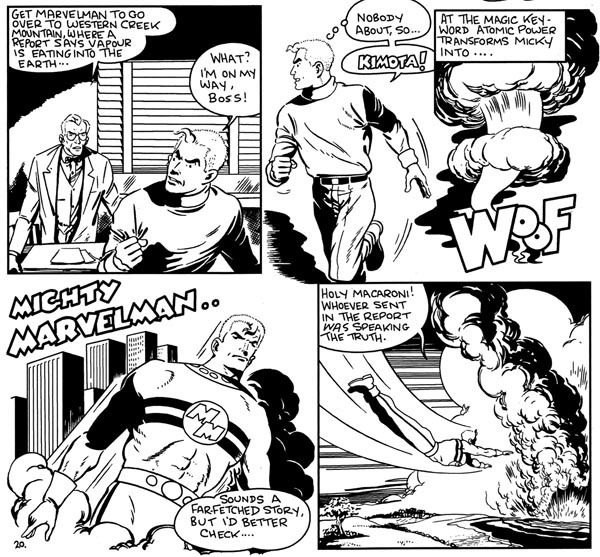 The original Marvelman was fanciful, cheerful, and occasionally downright silly. Moore’s Miracleman deconstructed the character: an unhappy, overweight, married Micky Moran has forgotten his magic word and his life as Miracleman. Miracleman’s nemesis, the mad scientist Gargunza, was now revealed as an ex-Nazi agent. The grim, unheroic, eventual fates of Young Miracleman and Kid Miracleman were revealed. 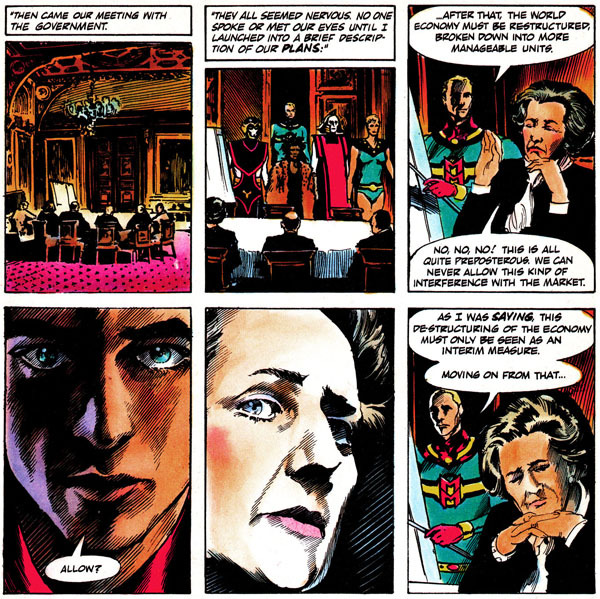 The shadowy politics of 1980s Britain and military ops were interwoven into Miracleman’s origin. Miracleman #9 showcased a controversial sequence, a medically accurate and graphically explicit depiction of the birth of Miracleman’s daughter. Miracleman #15 graphically depicts the horrific destruction of London — and thousands of Londoners — in a gruesome battle to the death between Miracleman and an old friend turned foe. 5. It brought us Neil Gaiman’s superhero writing. With his slew of bestselling novels and children’s books, there’s probably no other comics writer who is as well known by the general audience today as Neil Gaiman … but of course everybody’s got to start somewhere. He’d written Black Orchid for DC in 1988 and began Sandman in late 1989, but when in 1990 Gaiman took over scripting from Moore with Miracleman #17, comics audiences got their first look at his version of a superhero. 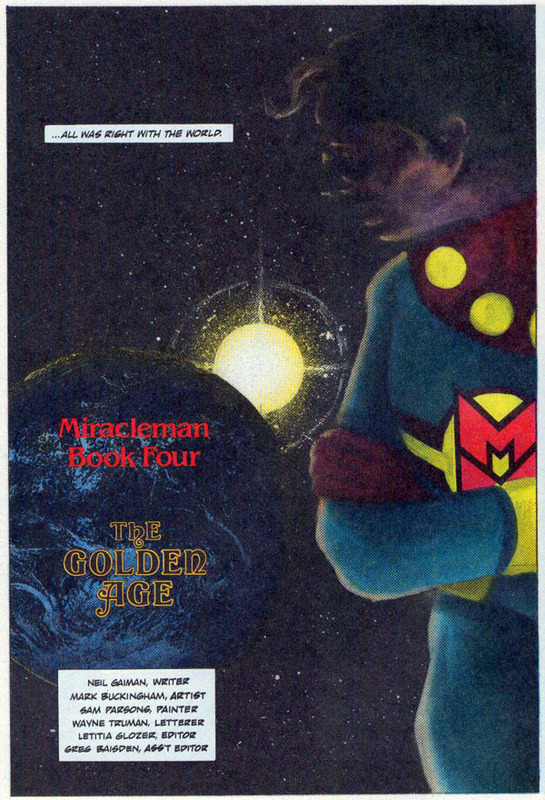 Under the story arc title “The Golden Age,” Gaiman chronicled Miracleman taking over the world. Both DC and Marvel had toyed with stories of their superheroes ruling the Earth, but always in “Imaginary Stories” or “What Ifs” that kept the status quo intact. 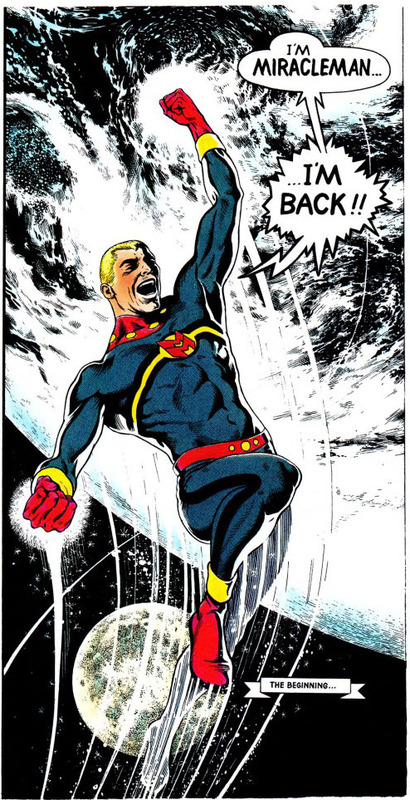 Miracleman decided the best way to keep humanity safe was to become its god, dictating the dismantling of the world’s governments and disarming every weapon. 7. … But it never concluded. Many of the new publishers of the 1980s ceased operation in the 1990s. 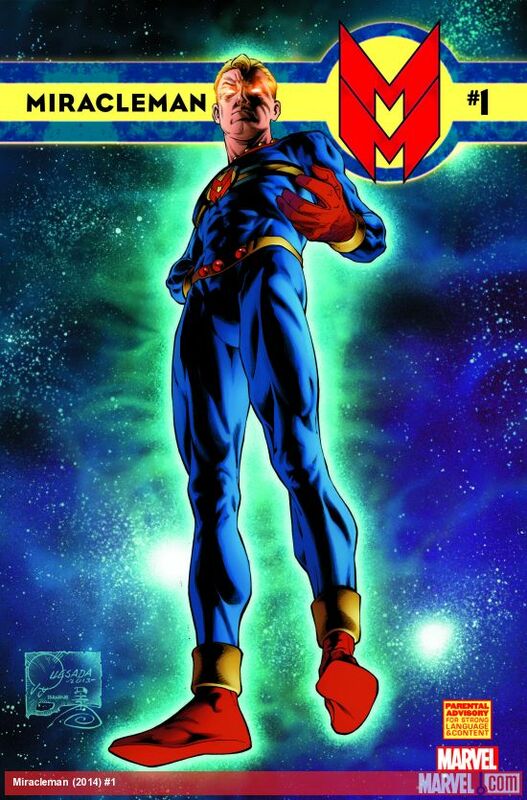 In 1994, Eclipse went bankrupt and publication of Miracleman ended. Issue #25 was never published (although Gaiman had already written it). The story has never been finished. 8. The title’s been one of the great legal battles of modern comics. Hang on, folks, here’s where it’s going to get complicated: understanding who owned the rights to Marvelman/Miracleman is more convoluted than the back story of Wolverine. (Deep inhale to begin:) Creator Mick Anglo had always claimed full rights, but in 1966 Marvelman’s UK publisher L. Miller sold off the rights to publisher Alan Class, Ltd. When artist Alan Davis took over the series, he was given a percentage as well. Following Eclipse’s bankruptcy, Todd McFarlane bought all of Eclipse’s properties in 1996. 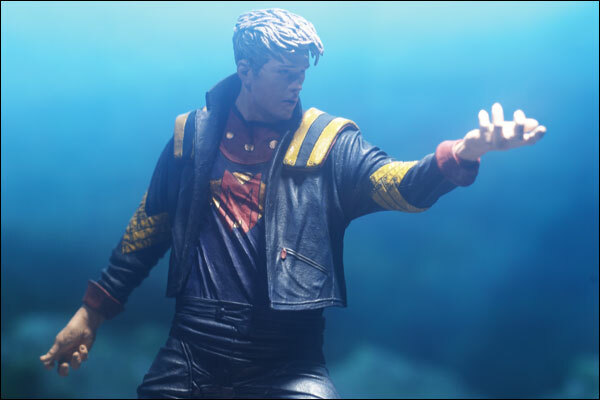 McFarlane began using their characters, including selling a renamed “Man of Miracles” action figure and statue and putting a “Mike Moran” character in a Spawn story arc. Gaiman sued McFarlane for ownership. At this point, it’s entirely possible that you or I owned Miracleman. Most recently, however, Marvel purchased the rights for Marvelman/Miracleman from Anglo (as well as, I would guess, every person on Earth), leading to Marvel’s Marvelman reprints of 2010 and this week’s new edition of Miracelman #1. Phew! As long as this explanation has been, it still only skims the surface of the Marvelman/Miracleman rights history and debate. I highly recommend the book “Kimota! 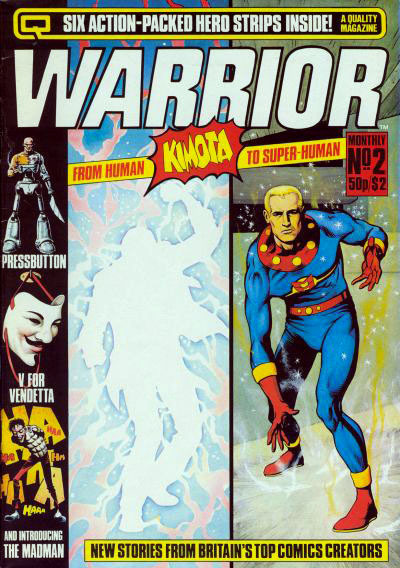 The Miracleman Companion,” by George Khoury (TwoMorrows, 2001) for its extensive series of interviews and commentary on not only Miracleman’s rights issues but also the series’ history and creators. 9. Newly remastered and reprinted for the first time since the 1980s. All this leads us to this Wednesday and Marvel’s Miracleman #1, 20 years after the last Miracleman comic hit the stands. Marvel’s version is remastered and recolored; original artist Garry Leach has praised the recoloring. Purists may object, of course, especially if they’ve been following the series since its black-and-white Warrior days. The original Eclipse coloring was occasionally oversaturated and gaudy, especially on the early, finely detailed Leach artwork that had been shrunken down from a larger UK page size. That’s likely not to matter, though, to the vast majority of today’s readers seeing it for the first time. More importantly, Marvel has announced Gaiman will continue and conclude his interrupted storyline. As a fan who’s spent two decades wondering what would happen next, I can’t wait. 10. But I’d still hang onto your original copies if I were you. The Miracleman rights questions and lawsuits mean that the original Eclipse comics and trade paperbacks still command exceptionally high prices on the back issue market, on eBay and Amazon, and in your local comic book stores. I ought to know: in 2007 I finally sold my run of Miracleman on eBay for an amount that rang a lovely, loud “ka-ching” above my head. Time and customer demand alone will determine if the new remastered reprints and eventual trade collections will hurt the resale market on the originals, but knowing the yen for comics collectors for originals, I’m betting it won’t. 10½. Every story has a happy ending. Well, yes, I did. I sold them to the woman who would later become my wife. Happy years later, I’ve got a wonderful woman to share my life, and she lets me share her copies of Miracleman. Happy endings all around! Ah, it could only happen in comics. Got a comment? Leave it below! Actually, hadn’t Moore already done several backup stories for DC, as well as high profile stories like “For the man who has everything”? Saying that Miracleman launched Moore in the US is putting the cart before the horse: it was because of his reputation that MM was published in the first place. Not exactly true. It was printed in England years prior, and US publishers were aware of it from that point, which is why they started hiring him. I don’t know exactly when the Superman Annual would’ve been published (I’ve seen both June and September cited, only one of which would be prior), nor do I know whether Eclipse’s cover dates are equivalent to those of DC, but it looks as if Moore’s “Green Arrow” story was definitely published prior to ‘Miracleman’ #1. And thanks to Bully for the pointer — I have to remember to explore this site sometime. Does anyone know where to get more hours in the day? Bully, The Bull of Miracles, sent me and I’m sure glad he did! I did sell my complete collection-which I read nearly every year that owned it. I bought every issue in a comics store for cover price or less. I am ECSTATIC that Marvel is republishing these books. But I am REALLY impatient because it has been several years since I’ve read them. That’s the most romantic “how I met my spouse” story that I’ve ever heard!